Like every other freelancer on the planet, I’m always looking for projects to keep me employed. If you know me, then you know that (like many Gemini’s) I work at many different professions, sometimes all at once! So it shouldn’t surprise you to hear that critiquing and content editing are among my many professional services. It often pulls me away from my beloved illustrating because I find it fascinating to read what other creative’s come up with. It’s one of those things that feeds my creative soul and more often than not, it gives me a great sense of accomplishment to know that I’ve contributed to making something good – even better…, possibly GREAT. However, in my search for entrepreneurial bliss, I sometimes run into things that I find a little unsettling. Lately, it’s the number of new authors who don’t do any homework prior to sending out manuscripts. Often I receive lengthy text pages that authors believe should be a picture book, or short manuscripts that they insist are chapter books! In addition to the unusual word count, the language used is often inappropriate for the targeted age group. In fact, it happens so frequently that I felt the need to talk about it and maybe clear a few things up. At the very least, posting my thoughts on the subject will give me a place to send confused newbies, awarding me more illustrating time! Warning….possible boredom approaching! This is basic stuff that is all over the internet. If you have been studying children’s book publishing for any length of time, then I’m sure you’ve already heard this stuff! If not, then you NEED to join the SCBWI, seriously folks. What I’m about to share is talked about in almost every children’s publishing conference and critique group across the globe. Here we go…. Simply stated, Picture Books and Chapter Books were created for different age groups, and for different reasons. 1.) Picture Books contain illustrations. 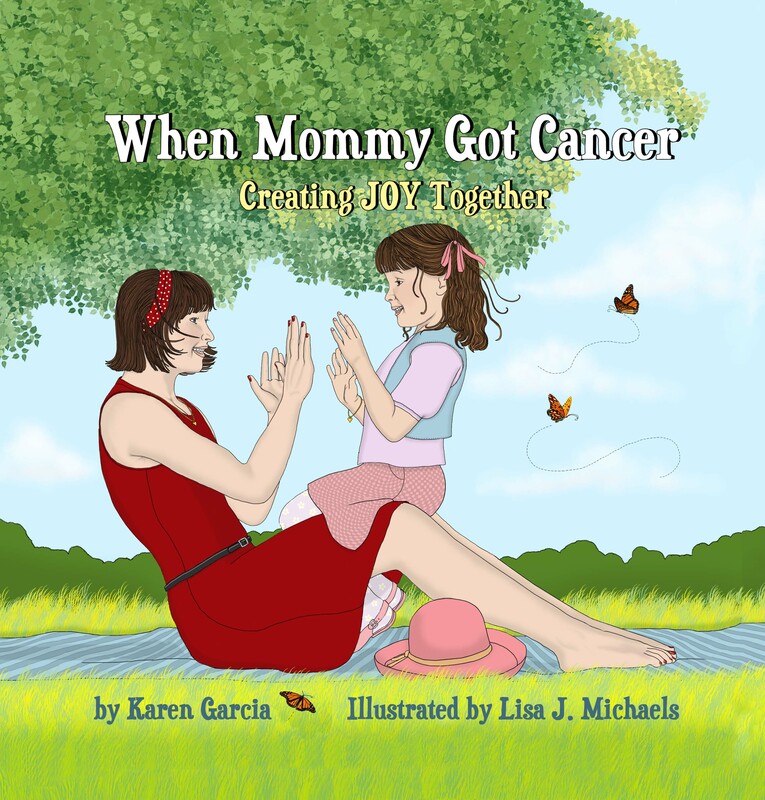 In most cases, the illustrations are in color and they assist the words by visually conveying the story to readers, ages 4-6. The text should (ideally) contain less than 500 words – due to the belief that today’s youngsters have a very short attention span, but up to 1000 words are acceptable for manuscript submission to most publishing editors. Picture book text should not be descriptive in nature. This keeps the word count low and allows the illustrations to do their part in showing what the words do not communicate. Words should be used sparingly to evoke emotion, move the story forward at all times, and invite a clear understanding of the action. If a sentence does not add something important or at least move the story forward, it should be removed. Picture Books come in a variety of sizes, most commonly 8.5″ x 11″ in size, as it fits squarely and snugly on library and bookstore shelves without toppling over or getting lost between other books. Traditionally, Picture Books are 24 or 32 pages. This harkens back to days before digital publication, when printing companies only printed books in increments of 8 pages (i.e., 8, 16, 24, 32, 48.) The first 3-4 pages are used for the Library of Congress and printing information, dedications, and a half-title page. The manuscript text and illustrations share the remaining pages. Authors should consider this information especially when self-publishing. First-time authors should consider the subject matter being exposed to 4-6 year-olds. If you don’t want your own youngster reading about a subject, then don’t write it and expect other parents to want it either! In addition, don’t preach to your readers. Children quickly lose interest if your book sounds too much like a “lesson”, and is not much fun. Conceal what you’re trying to teach in unique, comical, or relatable characters and plots. Your “students” will learn without knowing what you’re up to! Finally, if you’re planning to submit your manuscript to publishing editors, for goodness sake, write something fresh and new that they have never heard before! Even if it’s a new perspective on an old subject, it’ll have a better chance for acceptance than a story that’s been done before. Enough cats, dogs and teddy bear stories People! If you do write about your cat, it had better be one VERY unique, wonderful and irresistible feline!!! 2.) Chapter Books also contain illustrations. In most cases, they are in black and white and are used sparingly. There are two types of Chapter Books. “Early” Chapter Books and Middle-Grade Novels. For the sake of keeping the discussion brief, we will only address Early Chapter Books at this time. Early Chapter Books target ages 7-10, children who feel they are too grown up for “babyish” picture books. They still need (and secretly want) the aid of illustrations for clear comprehension, but the illustrations are simpler with less detail. Early Chapter Books contain well over 1500 words, often in the thousands. The words used are more difficult than those used in Picture Books, but authors should avoid overly complicated words. Don’t get me wrong, it’s okay to challenge your readers but don’t use words that require continual stopping to look them up! This can get tedious, causing readers to give up and walk away in search of a more enjoyable reading experience. Again, don’t get too preachy! This age group will throw your book down and run for the hills if they think for one second that you are trying to sneak something by them. However, if you can think of a fun and clever way to get information across, they’ll be all in and teachers will love you and your book! Chapter Books are usually 6″ x 9″ in size, fitting comfortably in hand and working well for traveling (backpacks). They are a great vehicle for authors who are looking to write a series, but that should NOT be your reason for choosing to write a Chapter Book. There are many terrific “stand alone” Early Chapter Books, and yours could be next. In conclusion, no matter what you write, KNOW your audience! If you are writing a Picture Book, keep it short and simple, with ages 4-6 in mind. Most of them can’t read yet, but they want to badly. They are seeking independence and use the illustrations to assist themselves in reading books when parents aren’t available. Let your illustrations tell the story as well, by choosing your words wisely. If you are writing an Early Chapter Book, remember that it’s for ages 7-10. It will be a small book, with sparse, small black and white illustrations that compliment the story. Now that you know the clear distinctions between Picture Books and Chapter Books, what are you waiting for? An illustrator perhaps? I’m always on high alert, looking for anything that will help me grow as an illustrator. That being said, you can imagine my thrill when I found out that Artist Agent, Christina A. Tugeau, was coming to a nearby college to speak…and it was free! I had learned about the CAT Agency several years ago, and stalked her website, looking for clues as to how I might improve my work in order to catch her eye. Perusing the list of incredible illustrators she represented, I soon realized that it would be a while before I figured out the magic formula….if ever. Flash forward…her lecture (this past Saturday) was amazing and eye-opening, even for a veteran like me. Among the things I learned was that it’s as much about how you handle the business at hand, as it is about the talent you possess. When assembling your portfolio for an agent to view, it’s important that it convey the fact that you know the steps necessary to get the job done. Include a storyboard or a dummy book to show them that you are familiar with page flow, book assembly, text placement, etc. Character continuity is where many illustrators flounder, so you must somehow include a range of positions, movements and emotions for at least one or two of your characters. This will show off your capabilities and prove that you have what it takes to successfully carry a single character through 32 pages. Oh, and I have to follow up with the fact that your characters need to be unique and your style different from those that the agent already represents. I also want to share the fact that your agent will most likely expect you to be a team player. If they’re going to do a great job representing you, then you have to be worthy of representation by doing the things they ask of you. Too many of us share the false notion that once you sign with an agent, you sit back and wait for them to get work for you. The TRUTH is, you have to keep working! Good agents will need you to keep the sketches coming, as they will be sending out promotional materials to publishers on a regular basis. If your not producing, you’ll become a hard sell. Who would want to rep someone who isn’t willing to grow and change things up occasionally? Let’s talk about your website and blog. Yep, it’s required if you want to work with a great agency like CAT’s. Let’s face it, they’re both simple, basic tools that show and tell agents and publishers who you are. Your website should be straight-forward and user friendly. Don’t make them search through a myriad of fancy graphic gadgets and buttons to find your illustrations…keep it simple. One click, and BOO-YA! There they are. Your blog is a different story. It requires you to string words together into complete sentences that make sense to the average reader. Don’t laugh! You’d be surprised how many people can’t do it! SO, if you’re not word savvy, what’s an illustrator to do…hummmm? My advice is to enlist a friend or relative and wrangle up those pesky prose. You don’t need to say much, as long as you post your illustration progress, experimentation, success and publications regularly. 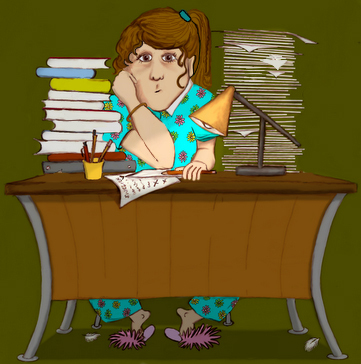 A blog shows everyone that you’re constantly working. I have included at the top of this post, the illustration I created especially for CAT’s visit. It’s a bit different than my usual style, reflecting on the recent changes I’ve made in my life and my way of thinking about children’s book illustration. I may never know what she thinks of it. As she turned to the page in my portfolio, the shrill voice of a fire alarmed screamed in the hallway, distracting everyone with it’s reminder that life can change in an instant. Confusion prompted another page turn, and unconsciously…another. She did not see it, but I dared not interrupt once she was able to refocus and continue on with the best portfolio review I’ve ever received. I am grateful for the opportunity that was given to me, and I’m determined to make it count! Today I was perusing my usual websites and came across a question regarding the safety of children’s book author’s manuscript “ideas”. The writer was worried that when submitting to publishers, his idea for the story might be stolen, revised/improved upon, and published without giving him the proper recognition (if any) and compensation due. I hear this concern a lot, so I thought I would give you my take on the situation, hoping that it will calm your fears. Editor, Purely Wornout, finally arrives at her office after fighting her way through yet another awful morning of NYC traffic. In desperate need of the coffee her secretary has been too busy to fetch, she plops down behind her desk, piled high with unread manuscripts that have been pouring in over the past week. Bleary eyed, she stares at the pile (about to topple over) of wanna-be authors manuscripts that her over-worked associate editor believes might be suitable for consideration. Purely wonders if she’ll ever again find the time to write manuscripts of her own, hoping it happens BEFORE the company is taken over or folds altogether. Dismissing the notion so that she can focus on the task at hand, she checks the multitude of notes left in front of her, listing all the calls that came in while she’d been arguing with the parking attendant. A few must be addressed immediately, so the manuscripts must wait. She’s not feeling too optimistic about her chances to get to them before this afternoon’s meeting, but she knows that it’ll have to happen soon. The boss is breathing down her neck. “This is pretty good” she says, as if someone could hear her among the wringing phones, office chatter, and general mayhem that her office windows can’t seem to squelch. She places it on her “maybe” pile, and moves on…hoping that before the day is out, lightening will strike, bringing with it a story that needs no revision because it’s undeniably the best she’s ever read. Most editors receive so many manuscripts that they don’t have time to think about developing on the ideas of others. They push through at alarming rates, giving most submissions about 30 seconds to “Wow” them before moving on to the next. It’s all the time that they can afford. Their job is to find the gem among the stones, and their continued employment with the company depends on that little gem being worth the cost that it takes to get it to the marketplace (about one-hundred thousand dollars per picture book). There isn’t time for underhanded efforts if they have any hope of making it through the constant influx of new manuscripts. Thousands pour into large publishing companies every year, and that number grows with each company merger or closing. The bottom line is, if you have a great idea, write a great book! Polish it until it sparkles so brightly that a submissions editor will be blinded by it’s perfection, dazzled by your brilliance, and compelled to pick up the phone to congratulate his associate editor for having forwarded to him/her the companies next acquisition! This morning, I read a complaint from an author who’d been burned three times by so-called “children’s book illustrators” who conducted themselves unprofessionally. The first person kept telling her that they were working on the illustrations, putting her off repeatedly. She let eighteen months pass before demanding an answer, then the illustrator finally admitted that she hadn’t been doing the illustrations at all! She then found two new illustrators to work on two different books. Both agreed to work on the books, then one decided to pull out without notification and the other hadn’t contacted her for weeks, even though she begged her for an update. I thought you might like to read my response, as it might help many self-publishing authors who are thinking of having their manuscripts illustrated in the near future. It’s a shame, but yours is not a unique story. There are thousands of people out there claiming to be children’s book illustrators, when indeed they have never completed even one book. There are others who forget they’re representing a business, and treat illustrating as if it were a hobby. Both types make the pro’s (like me) have to work harder for every dollar we EARN. Once a trust is broken, (often authors act unprofessional as well) the injured party becomes skittish and guarded. The new pro must then deal with gaining trust above and beyond the norm so that everyone can work in harmony. Authors who’ve been burned, tend to micro-manage after such an experience, and it’s understandable but not usually necessary if the new pro has a proven track record, meaning that they’ve worked with many happy clients, over a reasonable period of time, and produced many wonderful results. Another frustration for pro illustrators is that we have to bid against these unprofessionals, who bid ridiculously low prices because of their inexperience or hobbyist attitude. Unsuspecting authors looking to do things cheaply, jump to hire them without considering what they’re more likely to receive…unprofessionalism or second-rate work. Hiring a pro doesn’t have to break your budget, if you’re smart about it! Look for pro’s who are willing to break their fee’s down into monthly payments over the long-haul. Just because someone can draw well and claims to be an illustrator, doesn’t mean they are one! There’s a LOT more to it than just drawing pretty pictures! An illustrator should (once hired) be ABLE to provide you with a storyboard layout of your book. They should know how to illustrate your story in such a way that the pictures will ENHANCE your text, not just show what’s already being said in the text. I recommend that authors seeking illustrators should do their homework before hiring. Make sure that the prospective illustrator can give you references from other happy clients (that can be verified). Make sure that your illustrator can provide you with a legally binding, mutually beneficial contract that states WHEN/HOW OFTEN sketches will be delivered to you in a timely manner. It should state WHEN the finished full-color illustrations will be completed & give you a reasonable time frame for completion and delivery of the whole project (3-6 months, depending on the page count and details), and the contract should contain a break down of all the fees and what they are for. Once you sign the contract, your illustrator will be legally bound to follow it. Pro’s will do this by CONTACTING YOU periodically throughout the project to let you know how things are progressing. They will deliver sketches and completed illustrations according to the contract delivery dates. They will request your feedback along the way, proving that they are working on your project. There is no excuse for not contacting your client to report how things are going! YES, sometimes life gets in the way, and problems occur that slow down production, but a PRO always keeps their client aware of such things! A clear understanding and good communication are KEY to a great working relationship and a successful, pleasant outcome! Authors, if your illustrator does not contact you in a timely manner (according to your contract), you then KNOW that something is wrong! DO NOT hesitate in taking action. If your illustrator does not deliver the goods as promised, ask what’s up! You have the right to know. Finally, if both you and your illustrator conduct yourselves in a business-like manner, all should be well and the project will be a joyful one (as it should be). Nothing makes an author happier than seeing their dream become a reality, one page at a time! If your illustrator is not including YOU in the process, pull out quickly (siting breach of contract issues) and find someone else BEFORE you’re in too deep! Sadly for this author/illustrator, the Christmas holiday is over and it’s time to reorganize and dig my heels into 2014 by thinking six months ahead. What will YOU be doing in June of 2014??? More on that later. First I must morn the passing of what I discovered (just this year, after a decade in the biz) to be a gold mine of opportunity…last minute shoppers! Now I’m not talking about mall hoppers or Black Friday frenzies. I’m talking about shoppers who decide two weeks before Christmas that they need something REALLY special, and they’re willing to pay for it if they can find an illustrator who’s quick on the draw (no pun intended). I discovered that perhaps I might not be quite finished with 2013 after all. Much to my surprise, last minute gift seekers began popping up all over my radar! My first reaction was to laugh a wicked “Wha-ha-ha!”, thinking, who do they think they’re kidding? These people actually BELIEVE they can find someone to sketch, perfect, color and complete a project in time for the internet Santa to deliver it for Christmas? Impossible!!! I thought about it for about 2 minutes, and then I did it. I changed my point of view and quickly contacted every one of those creatively-crazed gift hunters and proposed a deal that they couldn’t refuse. I cut my prices 20%, offered simple (less detailed) illustrations that I could easily and joyfully produce, and accepted half payment on approval of sketches and the remainder due on final delivery. I wound up with three fun and fast illustration projects and no time to lose! I was so happy when the money came pouring in. People who are gift-giving and grateful for your last-minute compromises pay quickly and without argument. By Christmas Eve I’d easily made the money I needed to make things merry! I made six people VERY happy (the givers and the receivers), and I learned a great many lessons in the process about compromise, timing, and illustrating for the shear joy of it (something we illustrators often forget when projects are all we have to pay the mortgage). Today I’m settling in to start anew. For me and my family, 2013 was a year of shedding the past, clearing out cobwebs, sickness and mourning for what (and who) has been lost, and finding a way to finally, once and for all…put it behind us. The new year brings a promise of healing and the hope that all will be well again. In every way possible it will be a new chapter for us and we welcome the change with open arms! The only way I know of to make it in this business is to think six months ahead. Last June, I knew I’d have wrapped up all the book projects I’d been working on by December. I planned it that way and did everything to ensure it would happen. In July, I planned for promotions on the book (pictured above) to be released in January of 2014, and I acquired two new book illustration contracts to work on as well, so that I would have the income to carry me through to February 2014 and so on. The list of ways to promote oneself seems to be growing larger everyday, and that in itself presents a problem for creatives. I mean, if you attempted to use all the social media sites and advertising strategies, and attend all the workshops, seminars, book fairs, etc., you could spend at least 50% of each and every day doing nothing but promotional work. Not only is it exhausting, but it’s not practical for creative thinkers who need to spend as much time as possible creating their product! Creative people in general are not famous for their ability (or want) to self-promote. Most are the type that need space and time alone to do what they do best…CREATE. As soon as you start talking to them about “getting out there” and selling their wares, alarms start going off and panic sets in. Their creative spark shuts down. For writers – writers block sets in. For illustrators, the blank canvas becomes, well frankly…frighteningly blank! Everything comes to a screeching halt, as their brains overload by just the thought of such a huge undertaking. As someone who writes, illustrates and promotes my books, I have to force myself to find balance. Let’s not forget that freelancers also have to FIND work, which requires a huge chunk of time as well. I try to give everything in my life equal time, knowing that if I push through the things I don’t enjoy, I will eventually get to the things I love. Wether we like it or not, creatives first need to face the fact that self-promoting has become essential to survival. With self-publishing now easier than ever, the publishing industry as a whole has become extremely competitive. Self-promoting is a skill that must be improved upon daily, and applied to every facet of the creative process. As an illustrator, I’ve discovered it’s necessary to start visually promoting books way before they are available for purchasing. One example is to build a buzz for the book by adding interior artwork (if the publisher allows it) to blog interviews. Nothing promotes a book better than visuals. 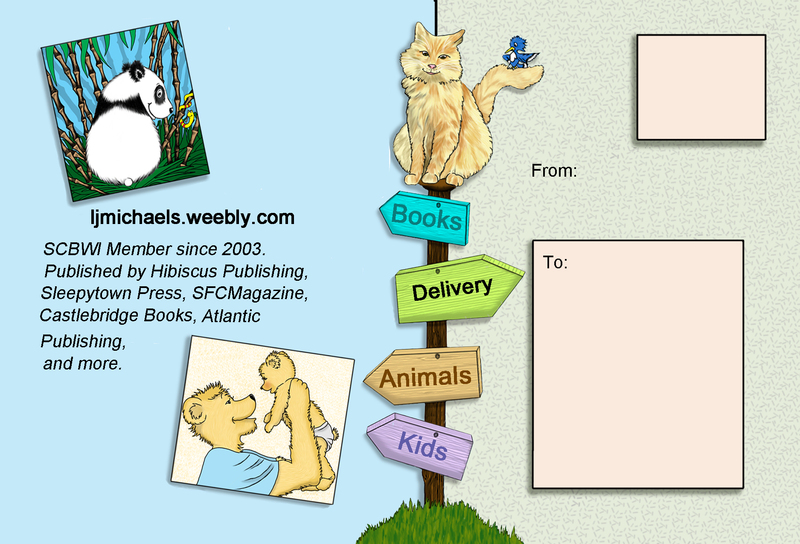 Post cards (above) are also widely used to promote illustrators to traditional publishers, as a way to acquire picture book assignments. Authors seeking traditional publication would be smart to plan their promotions and include the strategy in their cover letters to editors, as more and more publishers look for authors who are prepared to promote themselves. It is a selling point, and can really make the difference between a sale or (yet another) rejection. Self-publishing authors really need to be prepared ahead of their publication date, because the amount of promotional work needed to make a profit is staggering. The self-publishing author should have his/her author website in place, ready to roll when their book is released, so that every potential sale can be processed or re-directed to the correct place. There’s no doubt that the book writers and illustrators of today have a much bigger work load than those of the past, and they have even less time to actually create. With that in mind, we must be smart about how we use our time, and choose only the tactics that reap the greatest rewards and garner the most attention. We must keep our eyes on the prize, find where opportunities lie, create opportunities for ourselves, and seize them when they appear before us. When you’ve done all that you can do, success will find you. It may not appear in the way that you expected it,…but it will arrive in it’s due time. Of this I am certain. Well, It’s day seven of “PiBoIdMo”, and I’m right on schedule. I’m proud to say I have six Picture Book ideas and one Chapter Book idea (it started off as a PB idea and morphed…tee-hee!) that would knock your socks off! In addition, I’ve entered into all the drawings for prizes that have been offered, and I’m learning a lot about many of the wonderful authors and illustrators I hope to work with someday. They’ve been very inspiring to say the least! If you missed the date to sign up for this years Picture Book Idea Month challenge, you don’t have to miss out altogether. I hope that you’ll join me in the countdown by coming up with Picture Book ideas of your own. Jump in today and by the end of November, you’ll have twenty-three Picture Book ideas to work on in 2014. You won’t be able to blame your lack of manuscripts on a “dry spell”! It’s that time again! Fondly known as “PiBoIdMo”, Picture Book Idea Month will be in full swing soon, thanks to Children’s Book author, Tara Lazar. Now in it’s fifth year running, Tara has a full month of inspiration ready to role out for us, complete with editor and agent prizes! If you are a procrastinator, suffer from occasional writers block, or just need inspiration to keep you motivated, then this event may be just the ticket… and it’s free!! Click here to visit Tara’s blog site, and sign up by November 2nd, 2013 to participate. The rules are quite simple. Throughout November, each and every day, you must come up with at least one Picture Book idea, and write it down. By the end of the month, your reward is 30 inspiring ideas to work from for the coming year! It’s just that easy. Personally, I have purchased a pretty box for the occasion. Every day throughout November it will sit on my desk in front of my computer to remind and inspire me. I may be hit with an idea anytime, anywhere, so I keep a pad of post-it notes with me at all times. When I receive picture book inspiration, I simply stop…jot it down…and when I return home, I drop it in the box and forget about it. I don’t open the box until December 1st, and every year it feels like an early Christmas present to myself!